May 27th, 2016– MangaGamer is Releasing Playing Girlfriends, the second drama CD for Kindred Spirits! Tsurugimine Kiri and Koba Youka are both enjoying every day with their lovers. But at some point they realize their dates are getting a little repetitive and start to worry. When the two of them give it some thought, they decide to each plan a date for the other. What will Kiri plan for Youka, and what will Youka plan for Kiri? 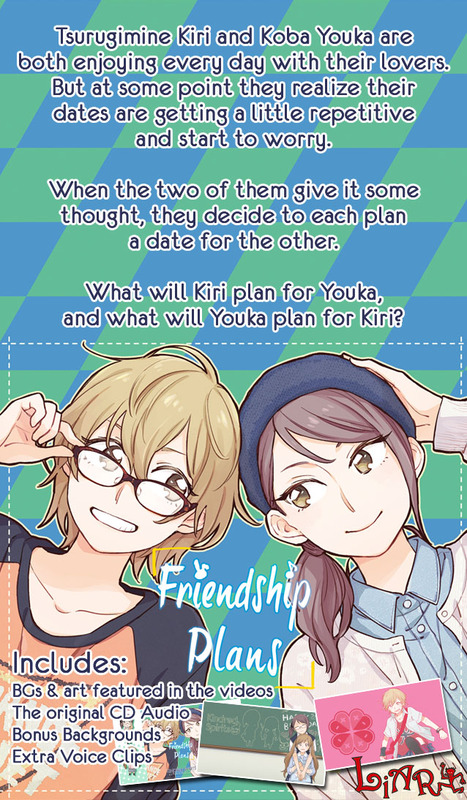 Friendship Plans, the second drama CD for hit title Kindred Spirits on the Roof are now available to own and download from MangaGamer! It will also be available to own and stream on Steam later today! Available for $9.99 on both, order from MangaGamer customers will receive the video, original audio tracks, bonus sound files, and Backgrounds as exclusive items. And don’t forget to check out the Kickstarter for Undead Darlings, running now! It’s almost halfway to its funding goal, but it still needs support from fans like you to get made! There’s also some new development footage that’s been posted to the campaign updates. Not only is it great to spend more time with these lovely ladies, but by purchasing you are ensuring that more content like this may come over. So to me this is a win win. Hopefully we Visual Novel and Yuri fans can see more of this in our futures. We will keep you informed of any further releases like this at Operation Rainfall.